Smorgasburg has arrived! Here are our favorite dishes from the new Sunday market. Worldwide icon-chevron-right North America icon-chevron-right United States icon-chevron-right California icon-chevron-right Los Angeles icon-chevron-right Smorgasburg has arrived! Here are our favorite dishes from the new Sunday market. Photograph: Erin Kuschner Amazebowls at Smorgasburg. If you were one of the brave souls who stepped out of an air conditioned apartment/mall/movie theater this past weekend to visit Smorgasburg in Downtown Los Angeles, you were truly rewarded for your sacrifice. The new market, which launched yesterday at ROW DTLA and will be a regular fixture every Sunday, was a hotbed of fantastic food and retail vendors, some coming from the original Brooklyn iteration of Smorgasburg and others that have been focusing on pop-ups and catering events in Los Angeles. I stopped by on Saturday for a preview and was blown away by the quality and ingenuity of the food vendors that were handing out samples. One of the most exciting aspects of Smorgasburg is the opportunity for new restaurants and bakeries, most without a brick and mortar, to introduce their dishes to a mass audience. And for Angelenos, it means trying out places that are on the cusp of making it big. 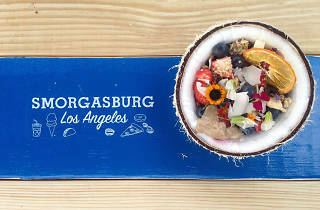 The Filipino food scene in LA continues to grow; at Smorgasburg, it's represented by Kalan Kitchen, an OC-based pop-up dinner series. While Kalan is serving a bunch of dishes you might recognize—pork adobo, smoked longanisa—their vegetarian pancit is a fantastic meat-free alternative made with pancit noodles, seasonal veggies, calamansi and crispy garlic. "This is the best pastrami I've ever had," said pretty much an entire picnic table before I ended up sprinting to Ugly Drum's booth for a sample. They were all right—the pastrami, which has made a couple appearances at Mendocino Farms over the years, was phenomenal (and don't worry, the above size is just a sample—they'll be offering full, massive sandwiches for $15 and half sandwiches for $9). LA isn't exactly known for its bagel options, but with Maury's, the future of bagels and shmear is looking up. The pop-up and baked-on-demand company is currently looking to set up shop in Silver Lake or Echo Park; in the meantime, they're serving some seriously great bagels at Smorgasburg. Classic bagel and lox and an avo bagel is on the menu, but I especially loved the Whitefish & Cukes with cream cheese option. I asked one of the employees working at the Primera Taza Coffee House booth what exactly is in this delicious sauce smothered over thick slices of decadent pork. "It's actually three sauces," he said. "But it's a secret." Fair enough, Primera. Just keep doing what you're doing. This Instagram sensation draws some of the longest lines at Brooklyn's Smorgasburg, so it's no surprise that during the preview everyone made a beeline for this vendor first. The drop is made with alkaline water and agar (a vegan alternative to gelatin), then topped with your choice of black sugar cane or green tea matcha and agar powder. But if you ask for it "animal-style," then you'll receive a drizzle of both black sugar cane and green tea matcha. I'm not sure how In-N-Out feels about this, but I dig it. You know pie extraordinaire Nicole Rucker from Gjelina, Gjusta and Cofax; now she's slinging her pies at Smorgasburg and, hot damn, they're delicious. Her Bee Sting pie comes topped with a big dollop of honeycomb, and her Chocolate Chess pie is both airy and rich with an incredible crust. In addition to their truck, Amazebowls is in the midst of opening two brick and mortar locations—one in Downtown LA, another in Venice. 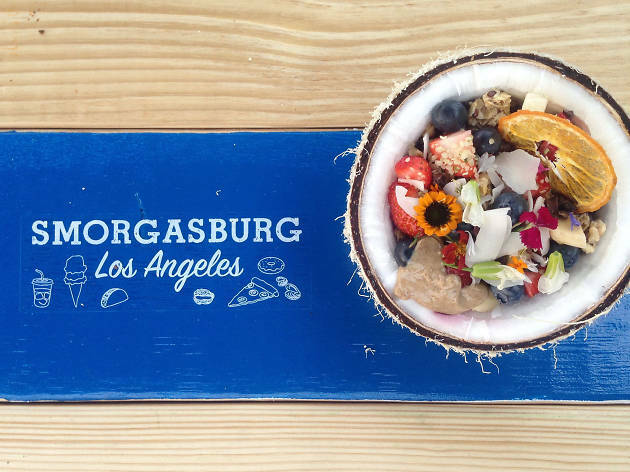 But in the meantime, you can snag one of these coconut beauties at Smorgasburg. The acai base is topped with fruit, coconut shavings, ginger, nuts and seeds, and they're just the ticket on a hot day. I also loved the biscuits and gravy from Good Gravy Bakes, ramen from We Have Noodles and the super food smoothies from Todo Verde. Picnic tables are scattered around the market for leisurely dining, and a couple aisles are dedicated to clothing, crafts and home goods. Thanks for the import, Brooklyn—we'll take it from here. Did you check out Smorgasburg this past weekend? Let us know what you think about the new market in the comments below!